Figured uses Canny to capture all of our user feedback. It's an open forum where you can add new suggestions, vote on existing ones, and start discussions with other members of the Figured community. 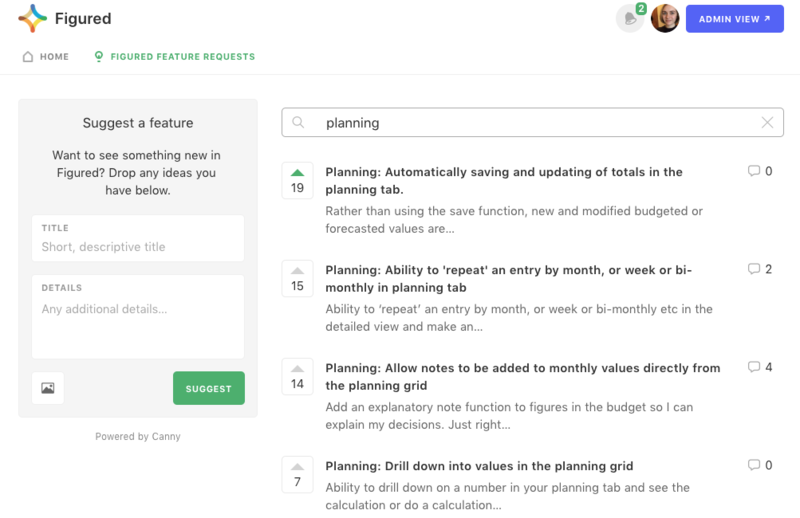 By seeing what requests are generating the most interest among our users, we can easily fast-track them into our product roadmap and get them actioned. Head to the question mark icon in the app and click Give feedback, alternatively the link to Canny is here. Not sure if someone has already added in your brilliant idea? Do a quick search for some keywords and see what pops up! Like what you see? Pop an upvote onto the suggestion, or click on the idea if you'd like to add some further comments too. If you don't find what you're after, use the Suggest a feature box to the right hand side of all the suggestions and add your idea in! You can also do this directly within the chat bubble all over Figured too.